Panoramic sugar Easter eggs are a traditional Easter decoration that are fun to make and beautiful to display year after year. Although they are made of edible ingredients, they're not intended to be eaten—save that for delicious chocolate Easter eggs. Instead, treat these sugar eggs as a decoration, pack them securely, and you'll be able to enjoy them for many years. If you've never made one before, be sure to check out this photo tutorial showing how to make sugar Easter eggs. In addition to the listed ingredients, you will need a large panoramic egg candy mold, an egg base candy mold (optional but recommended), a pastry bag and tips for decoration, small candies, toys, or sugar decorations, and royal icing. Here is a royal icing recipe or check out the photo tutorial showing how to make royal icing. Whisk the egg white until it starts to be frothy. If you would like to color your egg, add food coloring to the egg white and mix well. Note that you will be adding a lot of sugar to the egg white, so it’s a good idea to dye the white a darker color than your desired final product. In a large bowl, whisk together the granulated and confectioners' sugars so they’re evenly mixed. Pour the egg white into the sugars and begin stirring. At first, it will seem like there’s not enough liquid, but keep stirring. Gradually the sugar will become moister. Eventually, the sugar will have the consistency of damp sand. You want the sugar to clump together if you squeeze it in your hand, but avoid adding additional liquid and making it too wet—that will just increase the drying time. Once your sugar mixture is ready, start filling your egg mold. Scoop the sugar into the hollows of the mold and pat firmly down, packing it in. You want the egg to be smooth, so press down on the sugar to prevent any small gaps or cracks from forming. If you have excess sugar and want to make more eggs, keep it in a bowl and place a damp paper towel directly over the sugar to prevent it from drying out. If you are using an egg base mold, fill it at this time. Use a bench scraper, metal spatula, or the top of a large knife to carefully scrape across the top of the mold, removing any excess sugar. Your eggs should have a smooth, even top that is the same level as the mold when you are finished. Do the same for your egg base, if you are using one. Place a stiff piece of cardboard directly on the top of the mold. Bracing one hand on the cardboard and the other underneath the mold, quickly flip it upside-down so that the egg halves are now resting on the cardboard. Quickly remove the mold—you now have two beautiful sugar egg halves. Do the same with another piece of cardboard and your egg base, if you are using one. At this point, the egg halves need to dry out a little before you can use them. You can let them sit at room temperature for about 1 hour, or you can put them in a 200 F oven and leave them in for about 25 minutes. Once the eggs have started to set, they need to be hollowed out. It is important to do this when the outside is set enough to hold up, but the insides are still soft. Once the egg has fully set, it cannot be reshaped. Pick up the egg half without the flat panoramic panel. Hold it in the palm of one hand and use a spoon to scrape out the moist sugar. If you are saving your sugar to make another egg, you can add this sugar to the bowl and re-use it later. Continue to scrape the interior of the egg until you have a sugar shell that is about 1/2-inch thick. You want it to be as thin as possible, while still being sturdy enough to hold together. Scrape out the interior of the other egg half. Assuming you have a panoramic egg mold, you will have a flat panel on the front that should be removed entirely. Use a small, sharp knife and carefully poke a hole through the front. Be careful not to apply too much pressure and cause the egg to collapse or crack. Continue to gently whittle away to the front of the egg until you have removed all of the sugar from the flat portion. You will be left with one egg half that is completely round, and one egg half that has a “window” cut into the side. Note that if you do not have a panoramic egg mold you can still create this effect by freehandedly carving a window into one of your halves—draw a circle onto the egg to guide your knife before you start carving. At this point, the eggs need to dry out further before they can be completed. You can leave them for another 2 to 3 hours at room temperature, or place them back in the 200 F oven for about 45 minutes. Place them on their backs this time to let the inside portion dry. Once the egg halves are dry and very hard, you can decorate the inside with a beautiful Easter scene. Pipe a small amount of royal icing into the bottom portion of the intact egg half. This is to anchor everything else you add. Add a layer of green-tinted coconut or Easter grass, if desired, and press gently to adhere it to the frosting. Add toys, pictures, small candies, or sugar decorations. It is easiest to add a dab of royal icing to the back or bottom of your decorations to help them stick. Now it is time to glue the two halves of the egg together. Pipe a thin line of royal icing around the lip of the bottom half of the egg. Press the top half down onto the bottom, making sure that they line up evenly. Run your finger around the seam where the eggs meet to remove any excess frosting. You want to do this right away so that it will not begin to harden into unsightly shapes. Allow the egg to sit for about 30 minutes until the frosting has hardened enough to move the egg without damaging it. Now it's time to put the finishing touches on your egg. Pipe a decorative border around the seams where the two egg halves were joined together. A nice touch is to also pipe a border around the opening of the window, to better frame the scene inside and to hide any uneven edges. A border is not usually piped on the very bottom of the egg, as this is where it will rest in the egg holder. 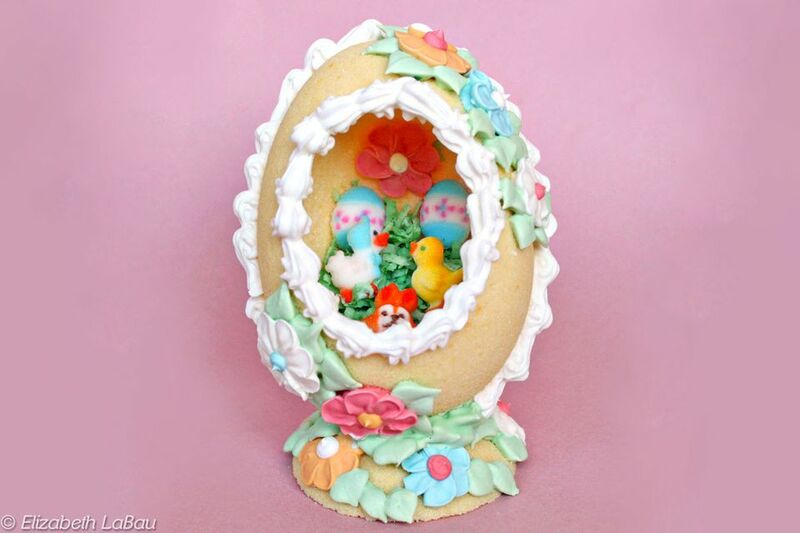 If you are not using an egg holder or have alternate display plans for your egg, decorate the entire thing. If you have frosting flowers or other decorations for the outside of the egg, now is the time to put them on. Use a small dab of royal frosting to secure them to the egg. Add leaves, stems, or any other decorative touches you desire. If you are using an egg base, pipe some royal icing into the base to secure the egg. Place the egg in the base and prop it against a wall or other straight object to balance it until the icing is firm enough to hold it. Once it has set, your egg is complete. Display your sugar egg during the Easter season. To save it, wrap it carefully in paper or plastic and store it in a box in a safe place. Do not refrigerate the egg and do not attempt to eat it. Stored properly, your egg can be saved for many years.